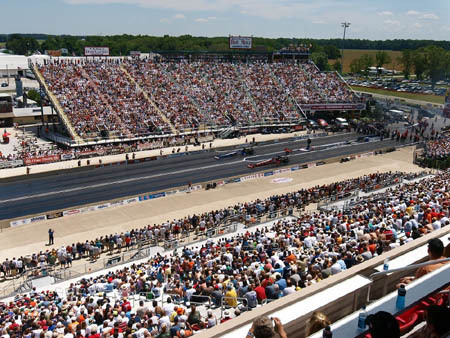 Summit Motorsports Park was in the spotlight during the National Hot Rod Association (NHRA) North Central Division Awards Banquet on Dec. 12, 2015, at the Wyndham Indianapolis West, where it was named Track of the Year. This marks the sixteenth time the Norwalk, Ohio destination venue surrounded by theme parks and water parks has received Track of the Year honors, including seven times by the NHRA (2008, 2010-2015), two times by the National Muscle Car Association (NMCA) and seven times by the International Hot Rod Association (IHRA), when it was an IHRA-sanctioned track. "I'm honored and humbled to be recognized by the North Central Division as 2015 Track of the Year," said Bill Bader, Jr., president of Summit Motorsports Park. "Our team works extremely hard and it's nice to see their efforts recognized." Also during the ceremony, Summit Motorsports Park was applauded for winning the 30th Annual NHRA Summit Racing Equipment Racing Series North Central Division Finals at Lucas Oil Raceway in Indiana in mid-September, where Summit Motorsports driver Nick Hastings won in Sportsman, Summit Motorsports Park rider Rick Poole won in Super Pro Bike and Summit Motorsports Park driver Chris Bear won the Super Pro Sunoco Race of Champions. Then, Hastings, who had gone on to become the 2015 NHRA Summit Racing Series Sportsman national champion at the NHRA Summit Racing Series National Championships, Nov. 12-15, 2015 at Auto Club Raceway in Pomona, California, was named ET Bracket Driver of the Year. The honors officially bring to a close what has been a banner year for Summit Motorsports Park, and its drivers, sponsors and fans will celebrate during its 42nd Annual Accel Banquet of Champions, January 15-17, 2016 at Sawmill Creek Resort in Huron, Ohio. For information about the park, which is located at 1300 State Route 18 in Norwalk, Ohio, visit www.summitmotorsportspark.com or call 419-668-5555.